Place all ingredients in a large soup pot, cover and bring to a boil. Reduce the flame to medium-low and simmer for 1 hour. Strain to remove the vegetables and discard them. 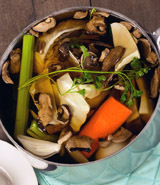 Use the stock as a base for soups, and stews. Makes approximately 12 cups vegetable stock. Can be placed in plastic containers and frozen for future use. NOTE: Any ends and pieces of vegetable may be substituted for those called for in the recipe - broccoli stems, turnips, rutabaga, daikon radish, green onions, shallots, any dried mushrooms,Eden Bonito Flakes, etc.